Is Columbia University Censoring it's Marching Band? 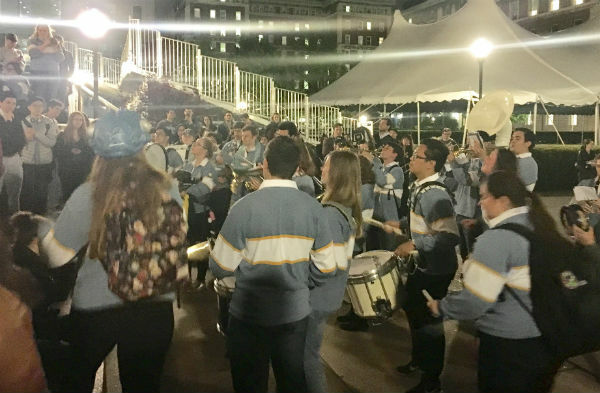 For the past 40+ years, members of the Columbia University Marching Band have performed "politically incorrect skits" at the campus library for “Orgo Night,” which is held at midnight on the same day of the organic chemistry finals. During this year’s Orgo Night, band members were met by campus security guards who forced them to play outside on the lawn of the library. According to College Fix, the administration posted the guards to prevent the band members from entering the library, where they perform. The university told the band that their performance was disruptive to students studying which clearly came as a response to the outrage from last semester when campus leaders staged a sit-in to protest the band's event and wrote op-eds decrying the band’s politically incorrect skits. As with their performances every year, the band took aim at the university’s faculty, students and policies with mockery and jokes. The band has since appealed to university president Lee Bollinger, to revoke the ban, which they argue infringes upon their right to free speech. This brings up a very interesting point of discussion. At most schools, the band is the band and that's it. The band doesn't allow for it's members to represent the band in political discussions or events that aren't sanctioned by the band. Students can go and argue or mock the university separate from the band as part of their personal rights as students. At schools like Columbia, Stanford, Rice and others, the band doesn't fit into the traditional marching band box. They have their own style, traditions and ways of operating. So, while this is a band tradition, does it make sense to potentially hurt the reputation of the band and the university by doing something so controversial? I'm sure that Columbia band members will argue that they exist to be disruptive, make jokes and create discussion as they have for decades. Totally understand that, but society's acceptance of these types of acts and jokes has changed. This has been made clear with the changes at Stanford to their marching band and the suspension by Humboldt State of their band. Universities across the country are cracking down on this type of behavior to avoid potential black eyes in the media. We can't argue whether that is right or wrong, but it is happening and it's up to the bands to conform to policies or face repercussions from the university.